It felt that my supposedly relaxing weekend was tarnished by seeing the ex with another girl. I actually decided against getting a massage as a treat for my birthday because it is expensive, but I was so ecstatic when I received a coupon offering a massage with hot stone therapy for half the price. So I called the spa center and got a mid-afternoon appointment. It was interesting that at the exact moment I was turning into the parking lot, my ex's car drove by. I could not be mistaken. The ex was talking and wearing a new haircut while there was a girl sitting on the passenger's side. The girl had her hands on her chin, leaning against the window, long black hair, huge eyeglasses, and she had that bored look on her face. I actually thought my eyes were cheated, so I took a second glance and I was right. It was an awkward moment. I tried to shake that stingy feeling, and it was perfect I was headed for a relaxing massage after that encounter. The massage was so relaxing and the hot stone therapy melted the pain and stress away. I closed my eyes and drifted away. It was interesting that in the calm and quiet of the massage room that I felt invincible and alive. It felt good. I felt great. I hope to keep feeling that way throughout the year. Heck, throughout my life. After the massage, I was so happy to find this package waiting at my door. It really cheered me up, and I can't wait to start writing on this journal. It is so beautiful, and the pen is so adorable. Thank you, Jo of Witsandnuts, for these beautiful prizes. 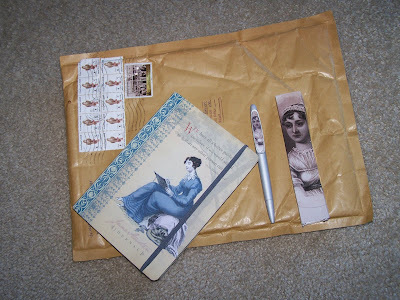 These are from the Jane Austen Online Book Club contest. The journal and the pen makes you want to write and write and keep on writing. Thank you, Jo. I love the stamps too. I'll be adding them to my collection. Yay, glad you liked the prize. I also kept a pen for myself. the relaxing massage, the surprise package - perhaps they were there to somehow muffle the sting. there's always some balance to everything, huh? Wits, I love the journal and pen. Thank you. Yes, it was a perfect moment to get a massage. kg, Thank you. I wish they'd make massages more affordable. If it weren't for that coupon, I would not have gone. Angeli, I agree. There's a force that seems to balance things in life. Hi Lailaa, I wish I could go on a retreat every month. JA sounds like a great place to shop. Thanks.